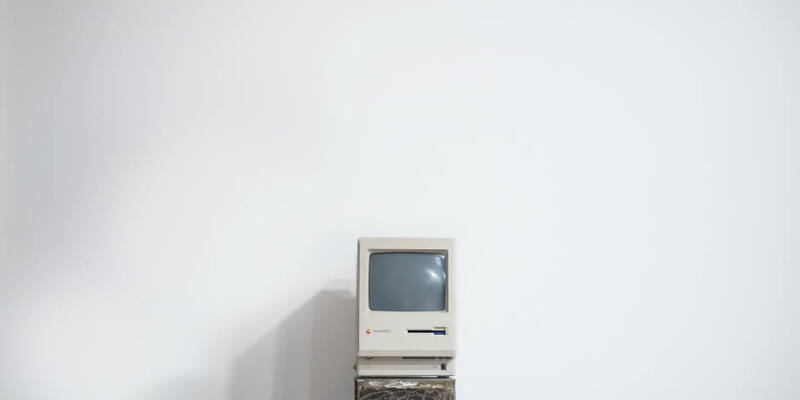 What will be the most important social media trends in 2019 for brands and businesses? 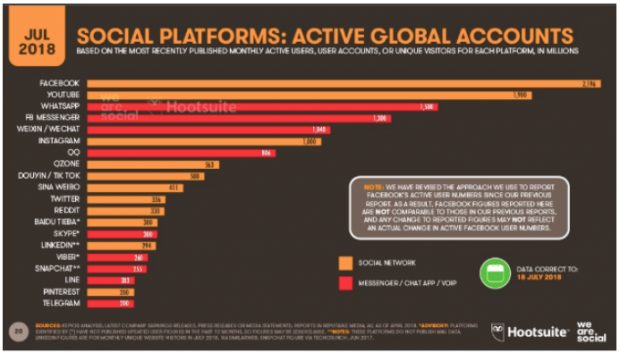 Hootsuite’s annual report has the answers. 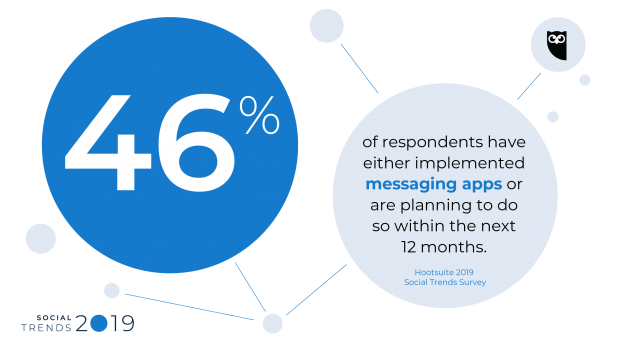 It’s based on a survey of more than 3,000 Hootsuite customers—from large enterprises to small agencies—conducted in late 2018. We’ve also included insights from interviews with dozens of industry analysts, as well as reports and data from Edelman, Gartner, GlobalWebIndex, Forrester, Econsultancy, Kleiner Perkins, We Are Social, and others. New formats, challenges, and ways of engaging make 2019 an exciting time to work in social media. Here’s our roadmap for navigating and thriving in the year ahead. 2018 represented a crisis year for trust on social media. In the wake of the Cambridge Analytica scandal and a Congressional hearing, Facebook faced pressure from users and regulators to improve security, transparency, and accuracy. Twitter, meanwhile, fought controversies over the large presence of bots on its platform, purging millions of fake accounts. In recent months, consumers, regulators, and media observers have questioned the privacy, accuracy, and ethics of nearly every social network. The result: 60 percent of people no longer trust social media companies. 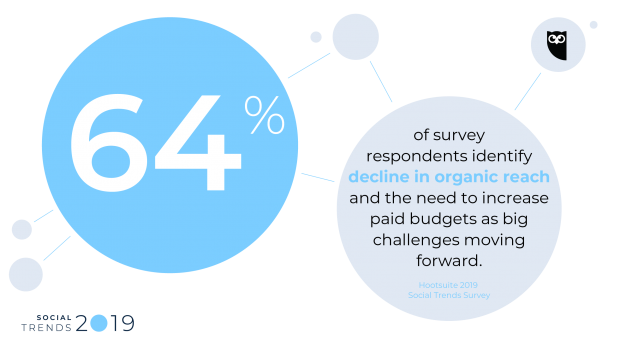 For brands on social media, this shift presents new challenges and opportunities. Users have grown distrustful of many media and celebrity influencers (whose followings, it turns out, are often bought or fake). Trust has reverted back to immediate friends, family, and acquaintances on social media, as well as traditional and trusted journalism outlets. Smart brands are focusing less on maximizing reach and more on generating transparent, quality engagement. Companies like Adidas and The New York Times, for example, are working to develop intimate, meaningful dialogue with smaller, more valuable audience groups. They’re creating communities and sharing insightful and researched content—then getting out of the way and letting passionate users talk to one another. To build conversation around your brand, create a short, easy-to-remember branded hashtag that brings your community together around a common interest. For example, Herschel Supply Co. has a popular branded hashtag, #welltravelled, for people who love to travel. They encourage their customers to share photos of Herschel products while exploring beautiful corners of the world. Use hashtags to align users around a brand value or noble purpose, rather than just a product offering. A Twitter chat is a public discussion on Twitter around a specific hashtag. Twitter chats are a great way to build community by generating lively discussions around your customers’ interests. The chats are held at a specific time, cover one topic or theme, and are led by a moderator. Hootsuite hosts a monthly #Hootchat on social media marketing and strategy, bringing together a group of engaged participants who want to learn more about social media for business. If you have a Facebook Business Page, you can easily create a Facebook Group to complement it. While your page will offer more general information, your Facebook Group can address niche interests and target your superfans. The key for brands is to create a space where customers can talk to one another. Facilitate that engagement and then get out of the way. Avoid heavy-handed pitches or product plugs. You can choose to make your group public or closed, and you should clearly identify the purpose of the group so people know why it exists. Include micro-influencers in your marketing strategy. When planning campaigns, consider hiring a micro-influencer to improve the quality of your outreach with more niche audiences. Unlike well-known or celebrity influencers, micro-influencers have smaller, highly engaged social media audiences. 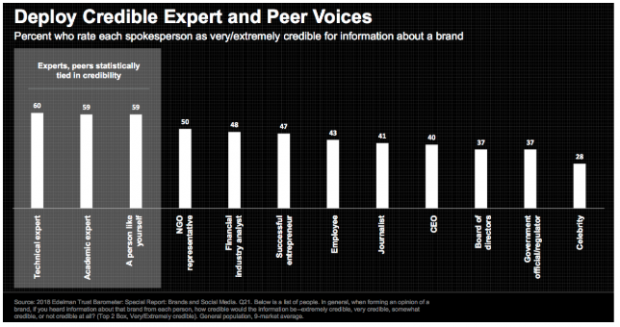 They are more affordable for brands, are viewed as more trustworthy by consumers, and often drive better results. One of the easiest ways to find micro-influencers is through a hashtag search on Twitter or Instagram. This will help you find people that have influence in your industry. To learn more about micro-influencers, check out this overview. Start a secret group on Facebook. Public groups on Facebook are open to everyone. Closed groups can be found via search but need admin permission to join. And then there are secret groups: invisible and unsearchable to the outside world. The only way to join is to get a member to invite you. For the right brands, secret groups can be an effective way to create an aura of exclusivity or intrigue, especially in the context of launches and special promotions. And members, free from the prying eyes of the outside world, may feel freer to share ideas. Check out MEL Magazine’s profile of the potato-chip themed Gettin’ Chippy With It Facebook Group. To keep customer trust, it’s important to communicate often, address problems proactively, and be as transparent as possible. Facebook Live Q&As are an excellent place to start. They make your brand feel more human by having someone talk to customers in real time. They’re also easy to manage and budget-friendly to run. Don’t worry about scripting beforehand—the goal is to be authentic and engaging in an informal setting. To share technical info and unique insights, tap into the experts already on your team, from product specialists to your CEO. And encourage employees to reshare branded social content that’s relevant to their unique audiences. Dedicated social employee advocacy tools can streamline the process of creating and amplifying social content. According to consulting firm Block Party, Stories—the vertical, disappearing videos invented by Snapchat—are now growing 15 times faster than feed-based sharing. 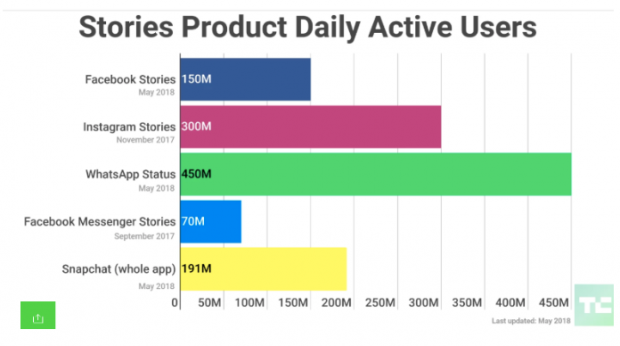 Facebook’s own chief product officer Chris Cox shared a chart showing that Stories are set to surpass feeds as the primary way people share things with their friends within the next year. And nearly a billion users across WhatsApp, Instagram, Facebook, and Snapchat already turn to Stories to share. Social media is pivoting from text-based platforms originally designed for desktop use (think early Facebook) to truly mobile-only networks that enable users to capture in-the-moment experiences—and Stories embody that pivot. Stories are overwhelmingly visual and meant to be created and consumed on the fly with nothing more than a smartphone and a creative eye. Because they’re ephemeral—often disappearing after a day—there’s more room for fun and experimentation. Stories feel real, immediate, and intensely personal. 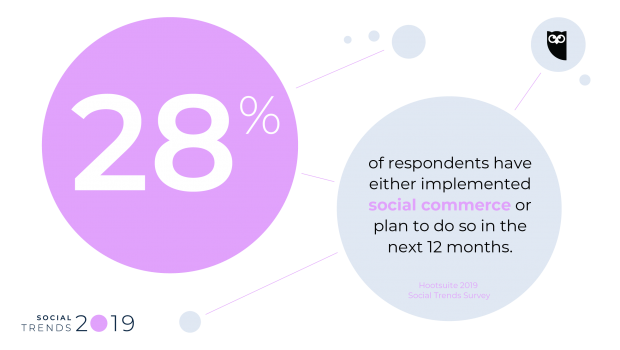 For brands, this social media trend requires a major shift in focus in 2019. While high-production-value posts are still important, it’s key to balance different content styles. Increasingly, brands are embracing the intimate, multimedia look and feel of Stories. The Guardian and Tictail are finding that less polished, more realistic Stories perform better than heavily edited takes filled with heavy-handed calls to action. An estimated four out of five major brands are already on Stories. If you aren’t creating Stories, it’s time to start. Stories can be as easy to create as you choose, so there’s a low barrier to entry for any team’s skill set. Share content weekly (and at different times of day) to see what works best with your audiences. Pro tip: Shoot your videos vertically. That’s how people watch them. Your content should reflect the unique look and feel of Stories—raw, unedited, and live action. 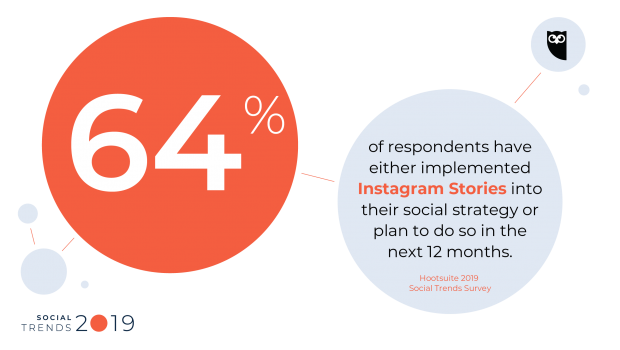 Our social team at Hootsuite tested both professionally animated and live action Instagram Stories, and found that live action videos performed significantly better because they matched the Story aesthetic people are used to seeing. Use the Stories Highlight feature. Despite their off-the-cuff style, Stories can sometimes take a lot of time to create and share. For brands reluctant to let their efforts simply disappear after 24 hours, there’s Highlights. Display select Stories as long as you want on your profile, along with a cover image. This feature is great for special promotions, campaigns, or longer, high-production videos that deserve extra attention. Tap your team’s full creative resources. Stories work best when they integrate video, storytelling, text, images, and more. Expecting a single social media specialist to integrate all these skills is a tall order. Instead, find ways for your video, photography, and graphic design teams to join forces to create something memorable. Get creative with your Story structures. Stories are easy to create and allow you to produce content quickly, so you should experiment with different structures to find what works best for your brand. For example, you can create tutorials showing people how to use your product, give a behind-the-scenes look at your company culture, host a takeover, or run a Q&A on topics that interest your customers. Add UTMs to your links to track success. Business accounts with over 10,000 followers (or verified accounts) can add a “swipe up” feature to their Stories. This lets viewers follow a link to another website or landing page. By adding UTMs to your Story URLs, you can track where users are going and get a better understanding of what content they like. If you don’t have access to the “swipe up” feature, add a link with a UTM code to your bio. Get in early with Facebook Stories. So far, Facebook Stories (which appear on the network’s flagship platform) haven’t really caught on. But CEO Mark Zuckerberg wants to get Stories right on Facebook and is investing a lot in the format. Currently, only around nine percent of major brands post to Facebook Stories, but companies that get in early may enjoy an early adopter advantage. Plus, it’s easy—the tap of a button lets you syndicate Stories straight from Instagram to Facebook. By now, everyone knows we’re in the pay-to-play era on social. Accordingly, marketers are increasing social ad budgets (up 32 percent in 2018 alone) and producing more ads than ever before. One of every four Facebook Pages now use paid media. And Facebook already accounts for 23 percent of total U.S. digital ad spending. But rising costs and fleeting attention are limiting ROI for advertisers. To counter this, paid social teams are pairing ad money with equal time investment, creativity, and targeting savvy. And they’re paying to boost their best performing organic content. Spotify and Netflix are leading the way with creative social ads that are at once personalized and entertaining, rather than just bland banner ads squeezed into a news feed. The end goal is to generate user discussion and engagement, rather than simply “broadcast” an ad at an audience. We’re seeing brands build out their social teams (both in-house and agency) with skilled cross-platform content creators versed in video, motion graphics, design, and more. Enhanced third-party ad targeting tools, which enable easy A/B testing (in some cases with hundreds of variants), are also becoming the norm. Knowing your audience is key to high engagement. Each ad campaign should target a focused group based on interests, jobs, relevant competitors, and previous interaction with your brand. Social networks have different targeting options depending on the type of ad you want to create. If you don’t know who you’re supposed to target and why, research your customers to understand what their challenges are. Also find out how they interact with your business, brand, products, and services. Define your goals and metrics. It’s important to show that social media has a positive bottom-line impact on your business. That’s why every ad campaign should have goals and metrics that tie back to business objectives and that you know how to measure. Your metrics will depend on the type of campaign you’re running and the audience you’re targeting. Awareness campaigns, for example, might focus on impressions, while conversion campaigns should put more value on click-throughs. With more brands competing for people’s attention on social media, ordinary posts aren’t good enough anymore. You need to create high-quality content that will resonate with your audience. Create compelling visuals, which are essential for clicks and high conversion rates on social media. Not every brand will have the budget for expensive equipment or a professional crew. But, learning some video basics or even hiring a freelancer can make a big difference. Repurpose concepts from top-performing organic content. This strategy will improve ROI because you’re investing resources into something that has already been tested. Use what you’ve learned from previous campaigns to improve performance. By running ads and measuring their performance, you can compare results and set benchmarks for future campaigns. The right analytics tools can help you track results and revenue generated by your social media efforts. Incorporate these insights into your future efforts. The social ad space is one of constant innovation. Newer formats have the advantage of tapping into consumer curiosity, while also avoiding ad fatigue. Instagram Stories ads, for example, have been around since 2017. But this year Instagram gave brands the ability to use three consecutive photos or videos. Pinterest recently rolled out wide-format promoted videos. And Facebook Messenger ads now allow brands to connect with customers directly via instant messaging. No matter how savvy your ad team is, it’s impossible to predict what users will actually click on. That’s where split-testing (also known as A/B testing) comes into play. This scientific approach involves running multiple ads with slight variations (different images, different headlines, and so on) and then doubling down on the top performers. Facebook offers basic split-testing functionality through its dynamic creative ads, but for streamlined testing with lots of options, consider a third-party ad tool. In Asia, social commerce adoption has been swift, with 70 percent of China’s Gen Zers now buying direct from social. But social commerce hasn’t kept pace in North America despite the long-hyped promise of buy buttons. But new and evolving technologies are changing that—especially for young buyers. Instagram’s shoppable posts now allow users to go from discovery to checkout without ever leaving the app. And the platform has even added a Shopping tab to its Explore page. Facebook’s Marketplace is now used in 70 countries by more than 800 million people. And on Pinterest, 55 percent of customers using the site to find and shop for products. Video, in particular, is proving a critical bridge for social commerce. In a study of 5,500 consumers by video marketing company BrightCove, 74 percent of viewers drew a connection between watching a social video and making a purchase. And beyond the familiar YouTube, new formats—from in-stream buying plugins for Instagram to livestream shopping on WeChat—have emerged for integrating social video deeper into the buyer’s journey. So how do you start incorporating social commerce into your marketing strategy? It’s important to remember that what distinguishes social commerce from other channels is the social aspect. Finding ways to make shopping live, interactive, and seamless—even on mobile devices—is key. Set up shoppable Instagram posts. Before you can start selling products on Instagram, you need to have a business profile. Then you can add your product catalog to Facebook with Shopify or BigCommerce, and Instagram will approve your submission. This will allow you to tag products in your posts so your followers can browse and buy. Pro tip: Tag multiple items in one photo so that people can see how your products look together. Share your products in action. High-quality images and videos can help potential customers browse your products and get an idea of look and feel without going in-store. Showcase your products in a variety of different scenarios to add variety and keep your audience engaged. When creating content, think about your target customers—how they buy, their needs, challenges, etc. Promote your products with contests. If you want to get more followers browsing and buying your products, run a contest for products featured in shoppable posts. Make sure you outline contest rules and use an easy-to-remember hashtag so people can find and share the promotion. Pro tip: Make sure that your contest adheres to Instagram’s promotion guidelines. The top messaging apps—WhatsApp, Facebook Messenger, WeChat, QQ, and Skype—combine for nearly 5 billion monthly active users. That’s more users than the traditional social networks have worldwide. Across the board, users are spending more time on messaging and less time sharing news on social. This shift from public to private spaces is changing consumer expectations. Nine out of 10 consumers would like to use messaging to communicate with businesses, according to a survey of 6,000 people globally. In the U.S., messaging is the most preferred customer service channel. 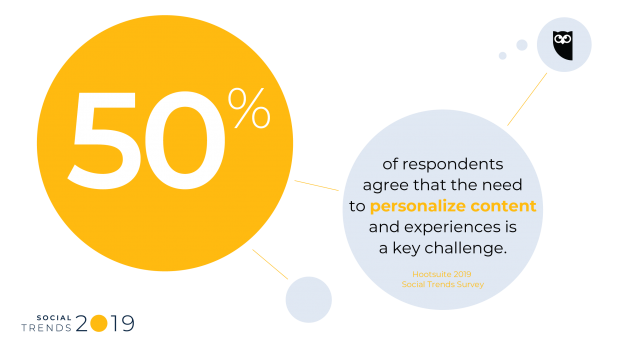 In a 2018 survey of 8,000 people conducted by Facebook, 69 percent of respondents said that directly messaging with a company helps them feel more confident about the brand. What’s clear, however, is that consumers don’t want more advertising channels. Smart brands are using messaging apps for more high-value conversations. So, how do you up your messaging game? Enable Facebook Messenger for your Facebook Business Page. This guide shows you how to enable Facebook Messenger on your business Page. Once you’ve done that, set up an instant reply for when users send you a message. This can be as simple as a short greeting, or you can provide more information such as typical response times and support hours. You can also share links in your instant replies to direct people to support pages or frequently asked questions. Add plugins to your website that drive customers to messaging apps. Show that your brand is available on messaging apps by adding plugins to your website. That way, customers can easily click on the plugin and reach you if they’re already on your website looking for information. Use DMs and/or messaging apps to streamline customer service queries on social. When customers reach out to your brand on social, it’s important to move the conversation from a public to private space. That way, you can ask for personal information like phone numbers and address details to resolve the problem faster. This can also preempt the need for time-consuming follow-up phone calls and emails. If your team isn’t available at all times of day, post your support hours and time zone in your bio so customers know when they’ll get a response. Set up bots and/or in-app assistants for frequently asked questions. Bots are an important way to scale your customer service efforts and create better experiences on social. While they can’t replace an in-person experience, they’re extremely effective for answering simple questions and helping with more transactional exchanges. This frees up time for you to focus on more complex customer needs. Run campaigns that incorporate messaging apps. Get creative with your social media campaigns and think beyond the news feed. Contests are a good way to start connecting with your customers because they often include a private messaging element to share contest results. Messaging campaigns often work best on mobile formats, so keep that in mind when creating your campaign. For example, Coca Cola ran a summer contest using Messenger and chatbots. Aimed at a younger demographic, the entirely mobile campaign encouraged customers to take pictures of their Coke bottles through Messenger to automatically enter to win prizes. Protip: Always check the latest promotion guidelines for each network before planning your strategy. Experiment with Facebook Messenger ads. Be mindful of when and how you use these ads, as contacting a potential customer by private message is a lot more personal and intimate than publishing a banner or News Feed ad. Make sure your ads are useful, immediate, and actionable. For example, you can share a discount or coupon after someone has made a purchase. Click here to access your 2019 Social Trends Toolkit.